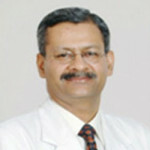 Dr. Prof Anoop Misra is an Indian endocrinologist and a former honorary physician to the Prime Minister of India. He is the chairman of Fortis Centre for Diabetes, Obesity, and Cholesterol and heads, National Diabetes Obesity and Cholesterol Foundation. Professor Anoop Misra has a multi-faceted personality and numerous distinctive achievements in clinical service, teaching, research, community health activities, and medical education, and health upliftment of poor people. He has an immense contribution to the teaching of undergraduate and postgraduate medical education.